How can I rename my email account's default “Sent” folder label in Outlook 2013 (via Exchange server)? I had a PC malfunction (crash or something? ?, as I can't quite recall how it all happened) whilst saving an image in Photoshop (I think). Upon restarting and returning to Outlook, my Sent folder had been renamed (to the filename I was working on... yes, in a completely different application). I don't know how this all transpired, but I can't seem to adjust the folder name now. It shows up on any other instance of my mail-box on another PC with Outlook, and also on the Outlook web client. The only place it seems okay is on my iPhone when connected to my exchange account, where it is shown as "Sent". 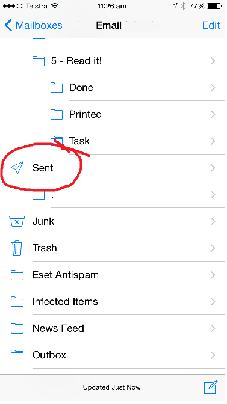 The functionality of this folder is still treated as the "Sent" folder, so that new messages are saved automatically in this folder, and are referenced to this folder (on searches). MFCMAPI: Session -> Logon, open required store, Open Root -> IPM_SUBTREE, click on the "Payslip 1.jpg" folder and edit PR_DISPLAY_NAME property as needed. 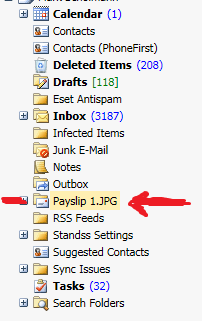 Set Outlook Folder Property utility: select the "Payslip 1.jpg" folder only (without subfolders), type "DisplayName" as a property name, "Sent Items" as a Value to set (all without quotes) and click Run. Not the answer you're looking for? Browse other questions tagged email exchange microsoft-outlook-2013 rename sent-items or ask your own question. How can I set Thunderbird's “Recipient” column to display my email address rather than a friendly name? I've searched my Mailbox in Outlook and opened one of the emails it found. Which folder is the email in?